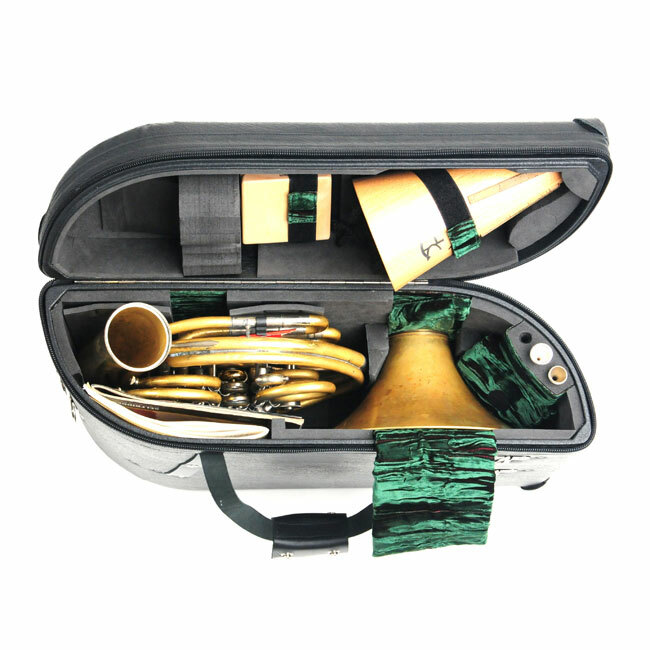 Wiseman Screw-bell French Horn Case. New case now available to order. Case weight : light. Approximately 7.8 lbs ( 3.2 kgs) Revolutionary new design. . Very slim design to ensure a good fit in all small aeroplane luggage lockers/compartments. French horn body and bell both suspended and held on adjustable rubber blocks. Hard, solid light-weight shell made from top-grade aircraft birch ply. 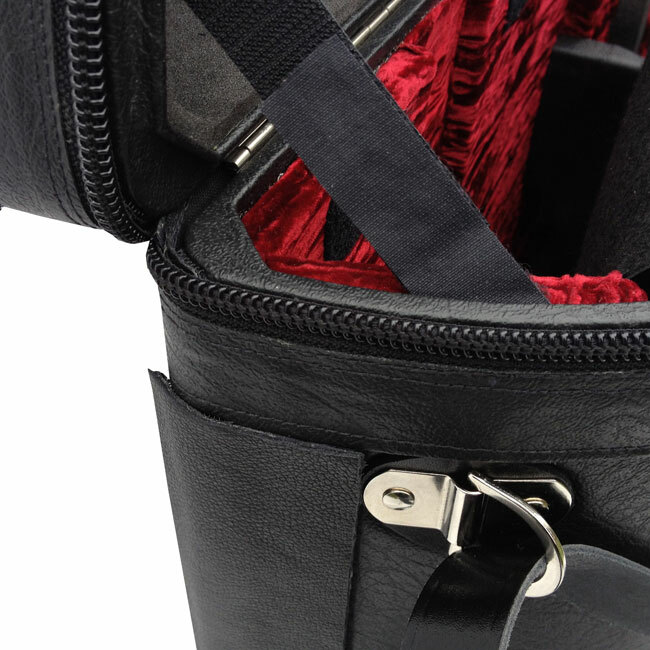 Detachable zipper, leather corner protectors and leather protection bar. All instantly replaceable if they wear down or break in years to come. 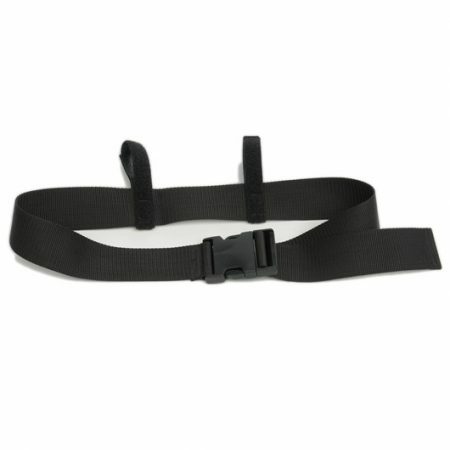 If the zipper breaks, just pull it off and place a new Velcro-mounted Wiseman zipper within moments. 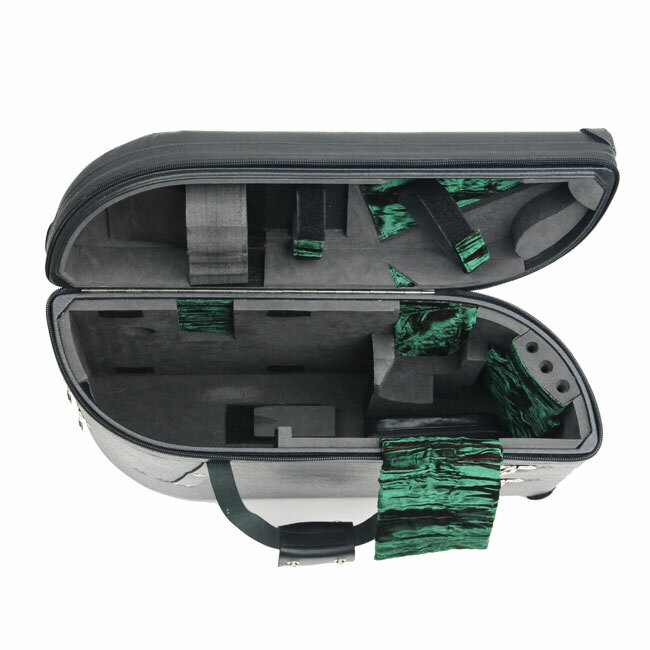 Specific spaces for two mutes, three mouthpieces, mouthpiece pouch, leather accessory bag (included) for valve oils, screwdrivers etc. Fully adjustable to fit any French horn (we need to know if it is an Atkinson), even triple deckers and horns with unusual extra protrusions and U bends. Holds music inside the case – even full size orchestral scores. 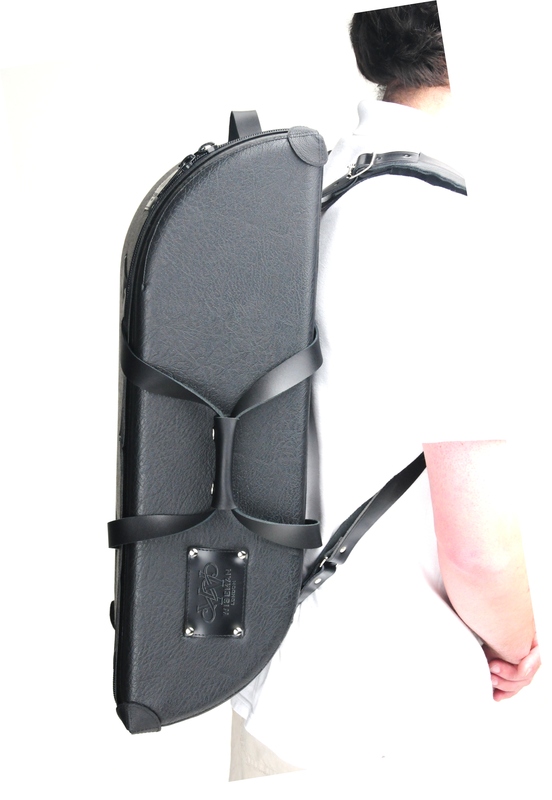 Adjustable music storage area divide ( removed from photographs to show inside detail of case) , to fit around single, double or even triple-decker horns. 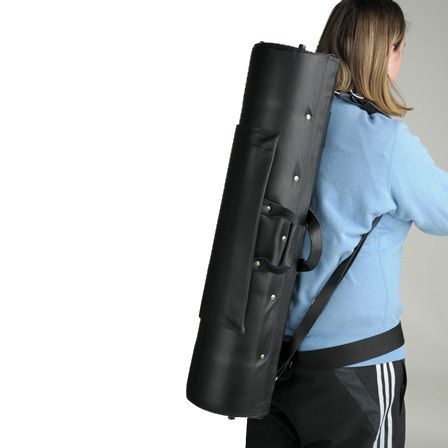 Designed to be especially comfortable when worn as a back-pack – complete with two thick leather shoulder straps and padded shoulder grips. 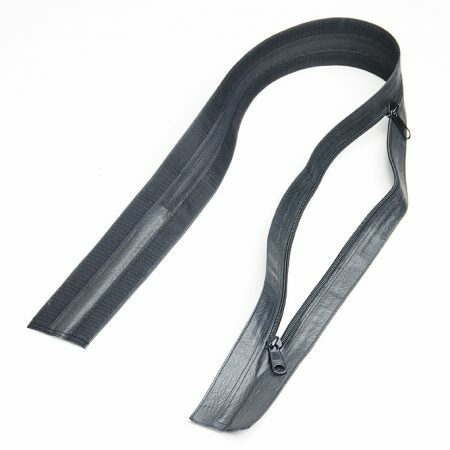 Leather handles with wrap-around soft leather grip and leather handle at top end of the case. Beautiful shape that provides a very strong crush-resistant and shock-absorbing shell. It makes a brilliant seat! 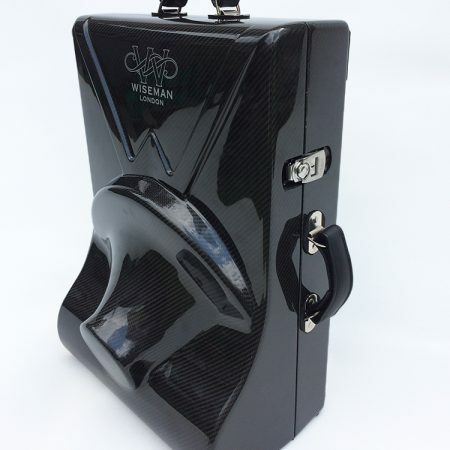 The case works brilliantly as a horn stand when the horn is fully assembled. Tiny foot-print (just under one square foot!) enables the case to be used in even the most confined spaces. 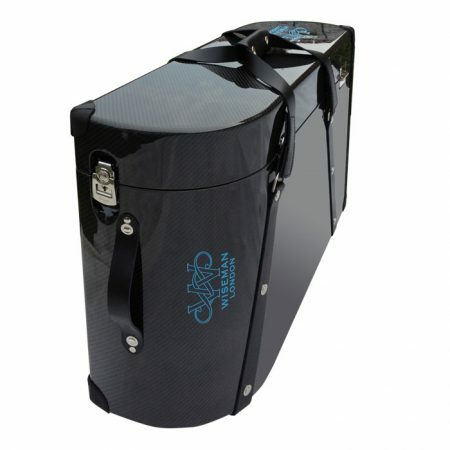 The case can be placed beside the horn-players chair and the narrow lid flipped open to provide simple easy access to the instrument and all accessories without the need to remove any detachable protective sleeves etc. as is often necessary with other brands of case. 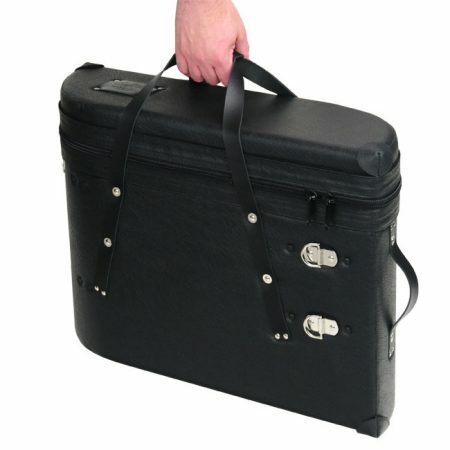 The Wiseman French Horn case carries a lifetime guarantee.